STAND monitors, exposes and combats all forms of religious bigotry and hate to fight against the dehumanizing effects of religious discrimination and inequality to secure freedom of religion for all. Freedom of religion is everyone’s birthright. All individuals, regardless of race, gender or place of birth, have the right to practice the religion of their choice, free from discrimination. Any form of coercion impairing that freedom of religious choice is prohibited. In the United States, the First Amendment to the Constitution protects freedom of religion. Internationally, Article 18 of the International Covenant on Civil and Political Rights and Article 18 of the Universal Declaration of Human Rights protect freedom of religion. Every new religion emerging through the centuries has faced biased and bigoted assaults from anti-religious forces determined to destroy them. That is the history of the fight for religious freedom throughout the world. Great religions survive such attacks, and the Scientology religion is no exception. False experts who flout scientific and credible academic opinion to spread lies and twisted sociological theories that incite and justify acts of violence and discrimination against members of certain faiths. The individuals portrayed here have all violated fundamental human rights by denigrating a religion and spawning hostility and discrimination. In a number of instances described herein, this has led to violence—which the perpetrators’ statements show was provoked by biased media. STAND takes action because, as history proves, to encroach upon the religious liberty of one is to threaten the religious freedom of all. 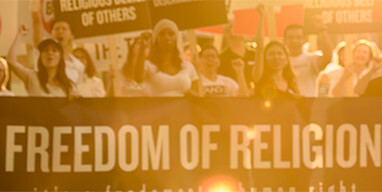 Scientologists have faced persecution and acts of violence instigated by biased media and anti-religious extremists. STAND is exposing the perpetrators of the hate and bigotry that gives rise to such acts of violence. STAND also endorses and makes available the Charter on Journalistic Ethics in Relation to Respect for Religion or Belief, a code of conduct that holds journalists accountable for the social and political consequences of their actions and emphasizes their duty to maintain the highest ethical and professional standards.